A large historic vacation home in the heart of Santa Fe. Perfect for reunions! The location is unbeatable for an in-town stay. The very close walking distance to the downtown area with the museums, galleries, shopping, restaurants, and to the only grocery store downtown just a block away, makes it perfect for exploring the town. You can easily walk to and from Santa Fe's shopping and attractions, and you'll love coming back to the big bubbling luxury hot tub seating seven people for a relaxing soak under the blue Santa Fe sky. The State Capitol can be seen down the street from the front porch, and the surrounding homes on our quiet street are typical of early Santa Fe. It is very quiet at the house on a narrow residential street just three blocks long. No street noise intrudes. It will make a peaceful and comfortable home base for your Santa Fe vacation and make your stay easy and fun. Capitol Casa is a large house with five private sleeping rooms and three full bathrooms. With an open living and dining area, a large den with four daybeds arranged around a big flat screen TV, a spacious back patio garden, and a front porch with glider, long bench, and chairs, it offers plenty of places for private chats or gathering all together. Singles love that they don't have to share beds. Gal pals love walking to and from the downtown sights and shopping. Children are welcome. Toys, chess, puzzles, games, books are in the two trasteros in the large den. A big school playground in the next block offers kids a variety of climbing structures, swings, and basketball hoops. We have basketballs for you to use. Two pack n play cribs, high chair, umbrella stroller, baby gate are provided. Built in the 1920's, the house is typical of downtown Santa Fe with its thick adobe walls and intimate scale, yet it is unusual because additions and remodeling have made it big enough to accommodate larger groups. There is plenty of room to spread out on the two levels of the house, with approximately 2,600 sq. feet of living area. While perfectly comfortable for smaller groups, it can actually accommodate the largest number of people of any house in the historic downtown area. The rates are flexible with a low base rate for smaller groups that steps up when the groups are more than eight people. Two bedrooms have king beds, and in the other three of the five bedrooms the beds can be set up as king beds or two twins to accommodate couples or singles. The large bedroom has an additional four twin beds. Two pack 'n play cribs and two roll-away twins are available for use in certain rooms. Groups of up to fifteen singles don't have to share beds. Five couples can have king beds in private rooms. Impeccable professional housekeeping satisfies even the most particular guests. 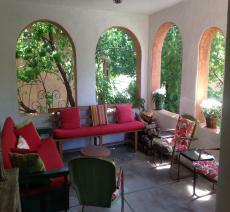 Its delightful, authentic early Santa Fe charm is enhanced by antiques and original fine art that decorate each room. Richly colored Oriental rugs warm the oak floors throughout. Handtinted plaster walls, the wood burning fireplace, and adjustable lighting provide ambiance. Amenities include luxury bedding with three sheet systems on the larger beds, high thread count fine cotton bed linens and duvet covers (hand pressed and laundered with fragrance free detergents), down and down alternative duvets and pillows, plenty of nice cotton towels, robes, a jetted whirlpool tub in the master bathroom, the big outdoor hot tub, and sundries such as soaps, shower gel, lotions and fragrance-free detergent. Our guests truly enjoy the luxurious experience these fine amenities provide. Firewood is supplied for the fireplace in the living room and for the chiminea fire pot on the patio. The kitchen is fully equipped for cooking and serving up to 18, with many small appliances along with tea, spices, and basic supplies. Dishwasher, refrigerator with ice maker, self cleaning gas stove. The dining table can be expanded to seat a large group, and lots of dinnerware, glassware, placemats and table cloths make setting a pretty table fun. Both gas and charcoal grills are on the flagstone patio, with serving tables, a large table and cushioned chairs for al fresco dining and morning coffee in the sun. You can see the mountains to the east from the patio. Free wireless internet works throughout the house. TVs are placed in the two front bedrooms, in the the living room with DVD & VCR, and in the small den. A 47" HDTV is in the large den downstairs along with a blu-ray dvd player--bring your thumb drives for show and tell. A stereo CD player with blue tooth connection is in the living room, and another stereo system is in the large den. DVDs, videos of movies made in Santa Fe, and a variety of music CDs are provided. Accommodations: The bed set-up is flexible, making it possible for different configurations of couples and/or singles to be accommodated. The numbers in parentheses below show how many people can sleep in each room. Our housekeepers will set up the beds according to your preferences using fine cotton hand pressed sheets, pillowcases and duvet covers on down and down alternative pillows and comforters. Off the living room on the main living level are two bedrooms entered via a small hall with door. The central full bathroom with long separate tub, walk-in shower and grab bars is between these two bedrooms. This lower level was previously a daylight basement recreation room, and it has been remodeled including the installation of larger windows in both rooms that meet code for fire-safe egress. It is comfortable and fully finished, though the stairs down are somewhat narrow. A handrail runs the length of the stairwell. Anyone who is infirm or who has trouble walking should stay on the main level, and there are grab bars and a walk-in shower in the central bathroom between the two front bedrooms. A shower seat and elevated toilet seat are available. Safety Features: Safe neighborhood with street lights. Flashlights, fire extinguishers, night lights, smoke detectors, carbon monoxide detectors and first aid kits are installed throughout the house. All rooms meet code for fire-safe egress, meaning with exterior doors or windows of the correct size and height from the floor for a fireman to enter and people to get out. A door is at the head of stairs. When that door is opened the stairwell lights automatically turn on. Handrail in stairwell. Handrail at the three outside entry steps to the front porch and main entry door. Porch light with sensor turns on at dark, and front walk and driveway landscaping lights are on automatic timers. Fans and air conditioning units are installed throughout the house. Heat and hot water supplied by brand new self-condensing sealed furnace. Readily available are our manager, our housekeepers, and my husband and myself should any problems arise during your stay. We'll always help you with advice and information. Pets: We need to approve any pets (dogs only; sorry no cats because many guests have cat allergies), and they cannot be left alone at the house unless they are crated. We have two dog crates to lend. The back patio is securely fenced with a locked gate. Walking dogs on leash through the historic neighborhood is fun and easy on the quiet streets, and we can direct you to places you can take them to run off leash. Location: It is just 3/10 of a mile to the historic Plaza, the center of town. It takes around 5 minutes to walk there from the house, and it takes about 5 minutes to walk to Acequia Madre and Canyon Road. It is truly so close-in that you will not have to organize driving to and from town. Some properties advertise that they are walking distance to the Plaza, but that can mean a mile or more. Groups without a car have stayed at the house, and they were happy to be able to walk all around the downtown and Canyon Road, and to well-stocked Kaune's market a block away, the only grocery store in the downtown core. They took the airport shuttles to and from the house. If you would like to do a Mapquest search, the house address is 513 Webber St., Santa Fe, NM 87505. Parking: There is parking off-street in the carport for one car, and in the driveway for two cars stacked behind it, plus there is free on-street parking for five more cars, two to the north of the driveway and two to the south in front of the house. These are on the same side of the street as the house. If you need more parking, just check with us. Airport Shuttles: If your group members will be arriving or departing at different times, the Albuquerque airport shuttles will drop off and pick up people at the house. Zoning: Capitol Casa is located in Santa Fe's Business Capitol District which gives it the proper zoning for unlimited short-term vacation rentals. In full compliance with all fire and occupancy requirements and licensed by the City of Santa Fe. We'll be happy to call you to answer any questions at all or to discuss the accommodations and rates. Feel free to contact us at any time. We will welcome you, your family and friends to Capitol Casa!